At its simplest, a pivot table is just a way of summarising a long stream of data into a tally chart. But of course Excel being Excel, you can go much further than that. For example, it might not just be a simple count up that you're after but totals or averages of amounts. You can also group the data differently to the way it's presented in your data table so that daily dated records can be grouped into monthly, quarterly, or yearly totals depending on what you're after. Regrouping for manager or area responsibility or remit is also a possibility. You can also create PivotCharts which are great visual summaries of the data source. 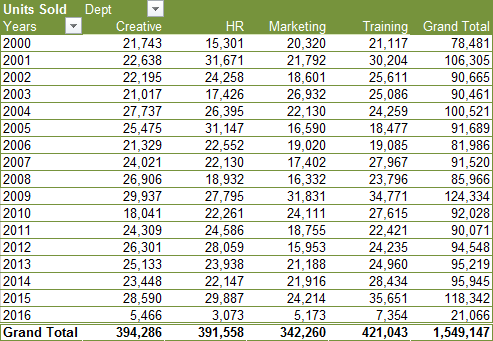 Converting data to a Pivot Table gives you lots more reporting power and allows you to be more creative with the data. There are a few downers, the main one being that if you amend or append records in your source data table the pivot table is not dynamic and has to be refreshed (recalculated) to show the changes. 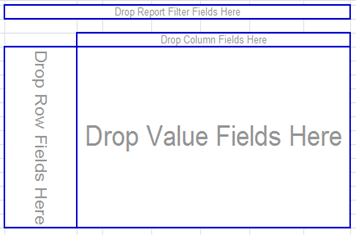 Format the Top Row of the list as Excel will usually recognise it as a Heading Row and so the column headings will become field names in the Pivot Table. Beforehand, if you can, decide how the data is to be summarised. By the way, if your data list has previously been converted to an Excel Table there is a massive benefit: your data range becomes "dynamic" and so it will automatically expand and shrink as you add or remove data meaning that it will always contain the latest data. So why don't you set up your own pivotal moments? Have fun using Pivot Tables and experiment!! Using an Excel Table as source data for a Pivot Table has a massive advantage as any new rows/columns added to the table will automatically be included in the pivot table. PivotCharts are great visual summaries of the data in the Data Source or PivotTable. 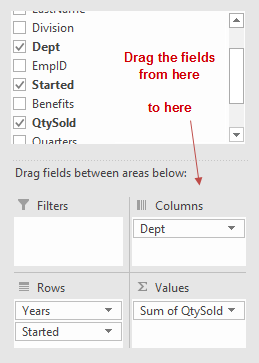 To focus on certain subsets of your data, use Filters to narrow data in the PivotTable. Slicers are easier and faster filters. Click 1 cell in the PivotTable then click PivotCharts Tools, Analyze tab, then Insert Slicer. Select the desired field on the next dialog then click OK. The slicer appears next to the PivotTable, any selected blue items will be reflected as a change in the PivotTable.